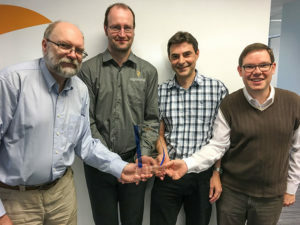 The Septentrio team — including Andrew Simsky, navigation algorithms software engineer; Wim De Wilde, system designer; Jean-Marie Sleewaegen, system architect; and Tom Willems, senior researcher — received the 2018 GPS World Products Leadership Award for developing the versatile PolaRx5 receivers, enabling many Earth-observing applications including worldwide ionosphere monitoring. Sleewaegen offers the team’s acceptance speech below. It is a great honor and privilege to be here and we are very happy to receive this wonderful award. On behalf of my colleagues Tom, Andrew and Wim, and the entire Septentrio team in Belgium, I would like to thank Alan and all sponsors and organizers of this dinner. From the beginning, Septentrio enjoyed close ties with the scientific community, and we continue to cherish this connection. Our PolaRx receivers, and especially our ionosphere monitoring receiver, is the result of a close collaboration with scientists at universities and research institutes around the world, some of them present here. 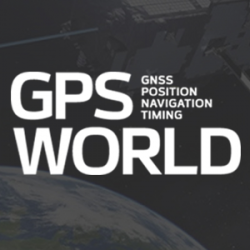 While the GNSS industry was and is still largely relying on legacy L1 signals, they have been early adopters of all new signals and constellations. For us, this has been a great motivation to implement support for all signals and frequencies at the earliest stage of availability. Ionosphere scientists are special folks. While most of us dream of getting rid of error sources, they just focus on them, and more specifically on small delays and variations caused by the atmosphere. They don’t want us to filter out these perturbations. On the contrary, they want to see them in their full glory. But the problem is, there are plenty of other error sources. Multipath, clock jitter, vibrations, hardware biases, interference are all out there and are hard to distinguish from what the ionosphere is doing. Our challenge was to minimize those noises and biases to extract the underlying physical signals. This exercise was really instructive, and this technology which we developed for the scientific community is now in the heart of all our receivers. Looking ahead, while the avalanche of new signals and satellites is an opportunity, it is also a huge challenge. In some regions, we can already track more than 60 GNSS satellites, all transmitting multiple signals, and this number will only keep growing. How to use all this information? What is the optimal set of signals for a certain application? 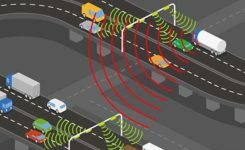 Are these signals all useful? With the many tracking options, how to guarantee compatibility between vendors? Many open questions still remain to be answered and will keep us busy for the years to come. We really appreciate the opportunity to be here, thank you for listening!